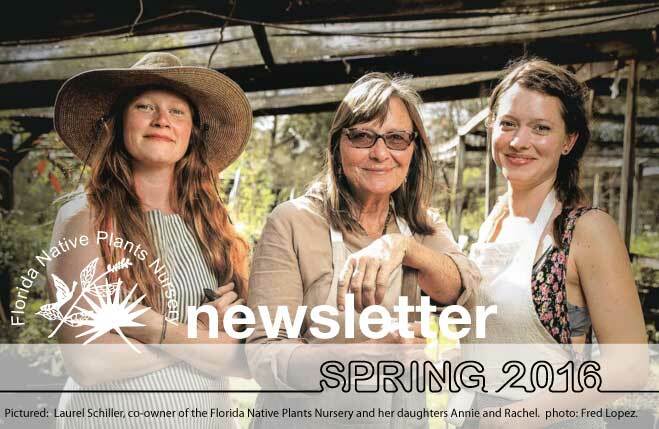 Our newsletter provides you with news from the nursery, gardening articles, coupons and sales announcements, and community news related to sustainable gardening with native and edible plants. 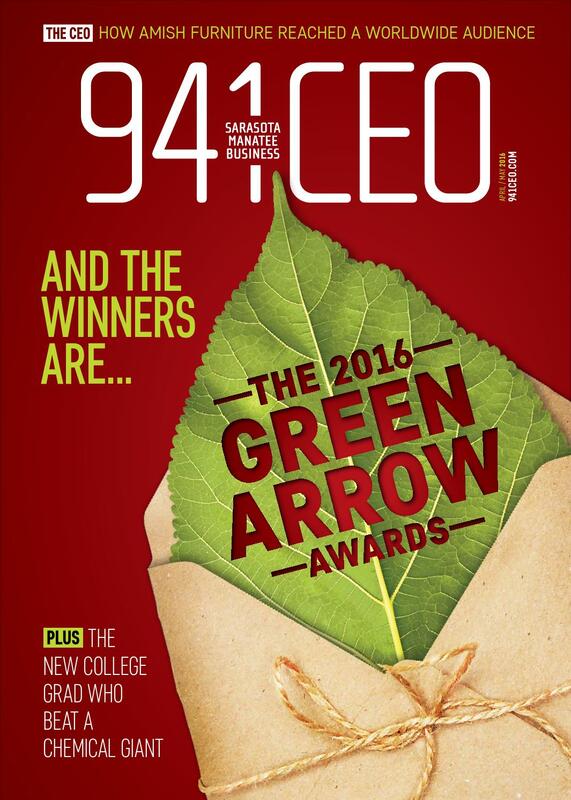 The Florida Native Plants Nursery received a 2016 Green Arrow Award from 941CEO Magazine for "greenest" retail business in Sarasota and Manatee Counties. Click the image to link to the article and read more about the award. 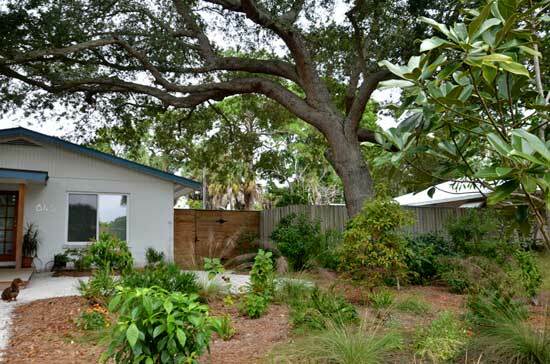 Upon completing a house, builders generally put in a few shrubs up against the building. But the foundation is not a good place to plant. It’s unhealthful for plants, for butterflies and other pollinators and for the people who live there. Either drowned beneath downspouts or drought-stricken under eaves or an entranceway, plants will not prosper. Pollinators will stay away. Mold can drift in through open windows. An example of a landscape with drought tolerant plants that thrive on rainfall alone. Constrained spaces under the eaves are often too wet or too dry, too sunny or shady for optimal growth. Soils are compacted. Crowding plants restricts airflow and sunlight, creating ideal conditions for mold and algae growth on foundation walls. Stressed plants are short-lived requiring continual replacement. Even if they survive, plants may outgrow the limited space available and require constant pruning in order to open windows or access foundation walls. 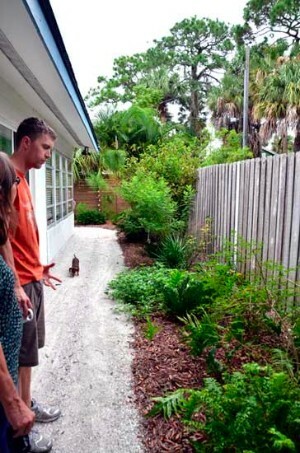 Left: As demonstrated here, the homeowner moved his plants away from the foundation walls and replaced with 250 Builder's Sand. 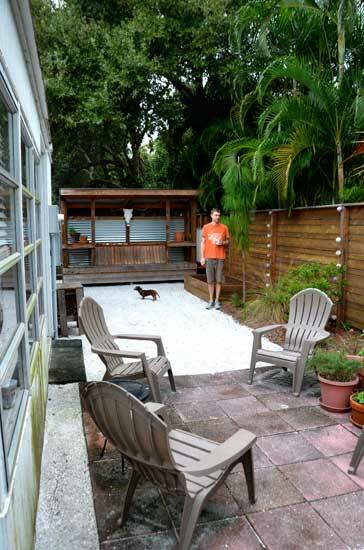 Above: 250 Builder's Sand is a permeable alternative to concrete. Plants in less than optimal conditions attract pests that feed on them or kill them outright. Decomposing leaf litter provides food and cover – the ideal habitat -- for roaches, ants, termites and other pests, which can get into the house. Pesticides are not the solution. Indiscriminate killers, they eliminate the pests but also beneficial insects, birds and other fauna feeding on them. 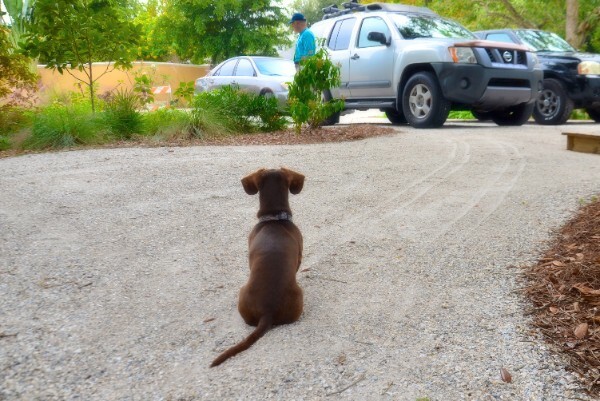 You or your pets can track poisons into the house. They can blow in through open windows. Though under-regulated here, many pesticides are banned in Europe because they are carcinogenic and contain neurotoxins, which affect the young and the old. Indoor air becomes unhealthy particularly in tightly sealed dwellings (see the Beyond Pesticides website for the dangers of commonly-used pesticides and effective alternatives). If your neighbors use pesticides your best protection is to fence your property and/or plant a buffer of red cedar (if you have space), wax myrtle, stoppers, Florida privet and Walter’s viburnum. To keep pests away, plant six to eight feet away from foundation walls and keep the area against the house sandy and dry without mulch or leaf litter. We recommend packing 250 Builders Sand two inches deep from the foundation walls out beyond the eaves. 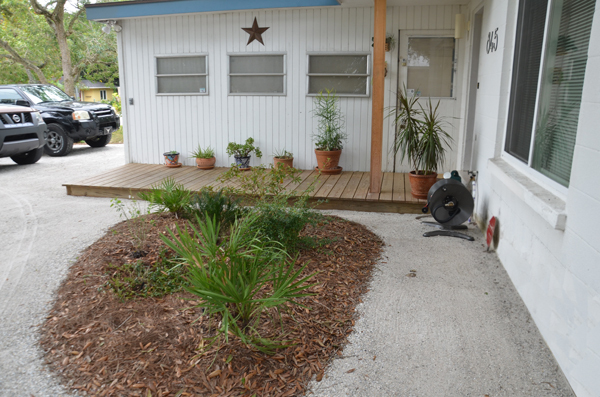 This hard-packed sandy walkway around the perimeter of the house provides access to windows and walls for washing or maintenance. It’s easy to sweep or blow leaves from its surface and most important, because it’s tightly packed compared to shell and stone, it inhibits weed growth. It allows air to flow around your home, which discourages the mold, mildew and algae so common during our long hot, humid rainy season. Check out architect Mike Miller's website (http://perfectisland.us/) for pictures and discussion of his use of 250 Builder's Sand on Anna Maria Island. Slated decking to the front door, minimizes tracking sand into the home. Plants are always mulched with Florimulch to cool the roots and conserve water. Traditionally, builders design home sites to direct storm water into roadside drains or retention ponds, from where it is carried off to waterways. Fertilizers, pesticides and animal manures in this runoff constitute a major source of pollution in coastal waters. More important, with its ever-increasing population, the state needs every drop of rainwater to percolate down from the land to recharge the seriously depleted Floridan aquifer that underlies the peninsula. Almost 50% of potable water in Florida is used for irrigating lawns and plantings. 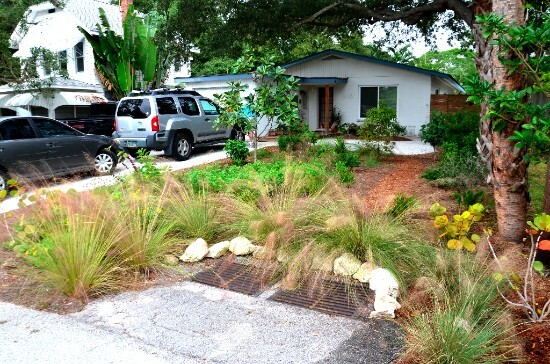 We can cut down or eliminate irrigation by planting drought-tolerant native plants in place of lawns, increasing permeable surfaces (choosing alternatives to concrete) and using captured rainwater on our properties. This reduces the runoff of polluted water and decreases the use of potable water. In Florida, fall, winter and spring tend to be dry; in summer, thunderstorms may dump torrential rains. After a rainstorm observe where water collects on your property and how long it takes to drain. If it collects, try to determine where it is coming from. The roof? Neighboring properties? Does it flow away from the foundation or pool around the perimeter of the house? The latter can damage the foundation, promote algae and mold growth and attract pests. Again, we recommend using 250 Builder’s Sand to fill low spots along the foundation packed two inches deep under the eaves. This will ensure that water flows away from the house rather than back towards foundation walls. Make sure gutters and eaves direct rainwater away from the building not towards it. Downspouts should be extended six to eight feet into the yard into planted beds. Keep gutters and downspouts clean. If rainwater spills over the eaves you can channel it into landscape beds or collect it in rain barrels or cisterns. Plants surrounding the storm drain help filter pollutants before they leave the property. Landscape beds should be six to eight feet away from the building where plants can benefit from good air circulation, intermittent sunshine, rainfall and rainwater directed to them. This is a good place for those native plants that tolerate soakings and dry times. Capture and filter rainwater through planting beds before it flows off your property. Consider creating a rain garden or two by deepening a planting area to collect rainwater where the ground stays wet most of the time. 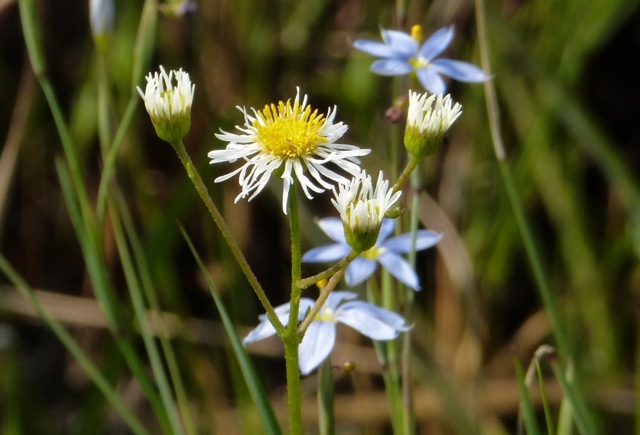 Plants that do well here include grasses (Fakahatchee and cordgrass) reseeding wildflowers such as tickseed and wetland edge plants like mistflower, iris, salvias, rain lilies and spiderwort. 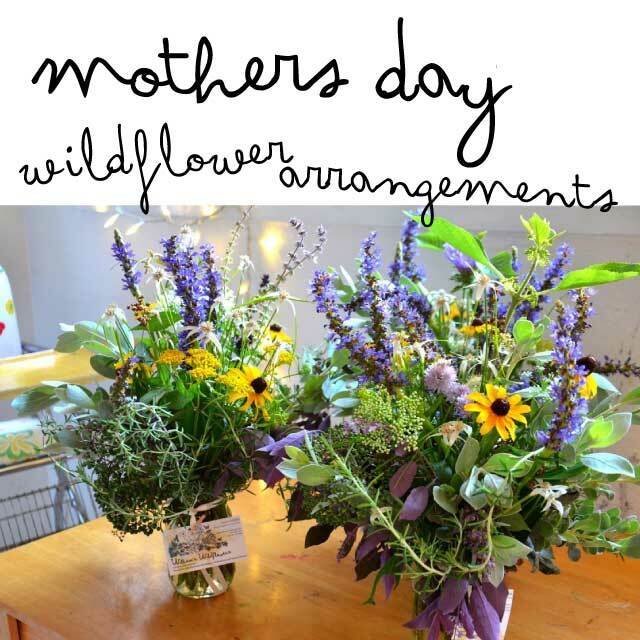 We are offering Mother's Day arrangements featuring locally-grown native wildflowers! We are a studio florist and offer special arrangements like these only a couple of times a year, so take this opportunity to gift one and keep one. Arrangements will be available for pick up at three locations: the Nursery, downtown Sarasota and Venice. Details when you purchase. $25 each plus tax. Thank you for reading and subscribing to our newsletter. Click to view larger (printable) coupon. Good through May 31st, 2016. Available for purchase at the nursery for $4 dozen. 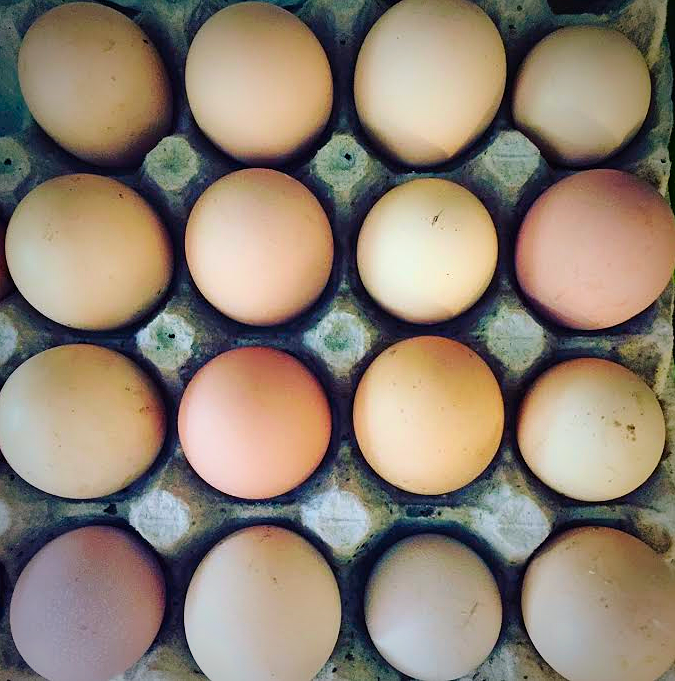 These are organically fed and free range chickens, doesn't get any better than that. Don't forget that May 4th is International Respect for Chickens Day! 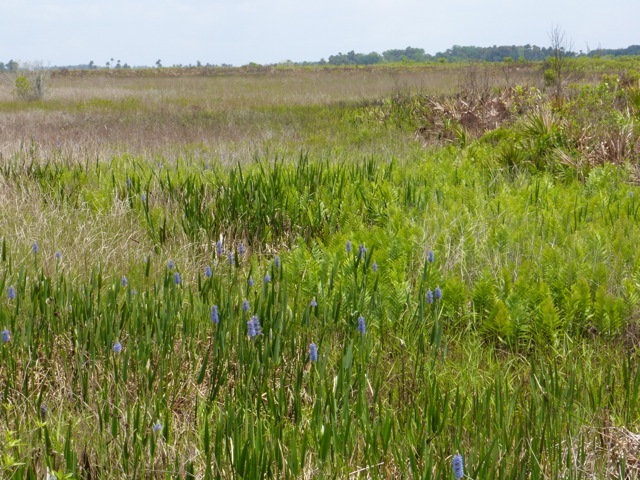 On a blue-sky day at Kissimmee Prairie, I walk a vast landscape of saw palmetto and tawny grasses dotted with colorful wildflowers. 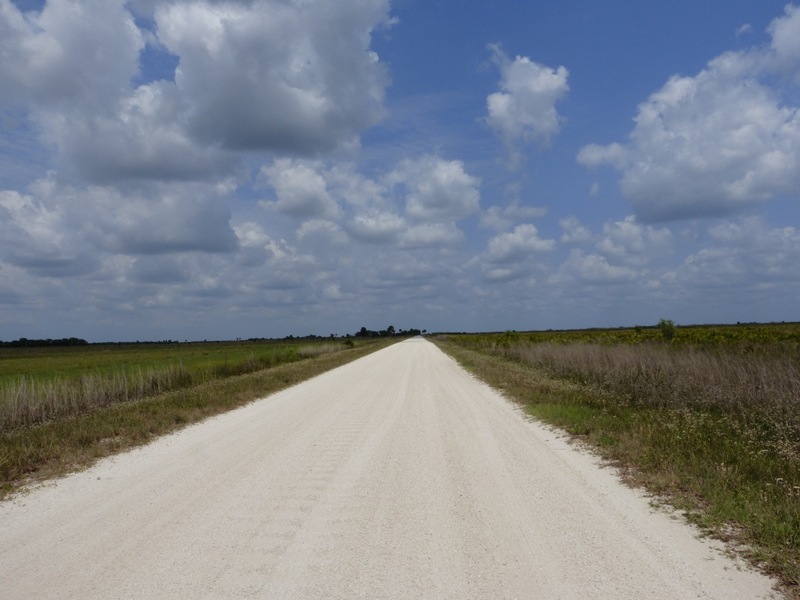 Islands of sabal palms offer relief to flat vistas. 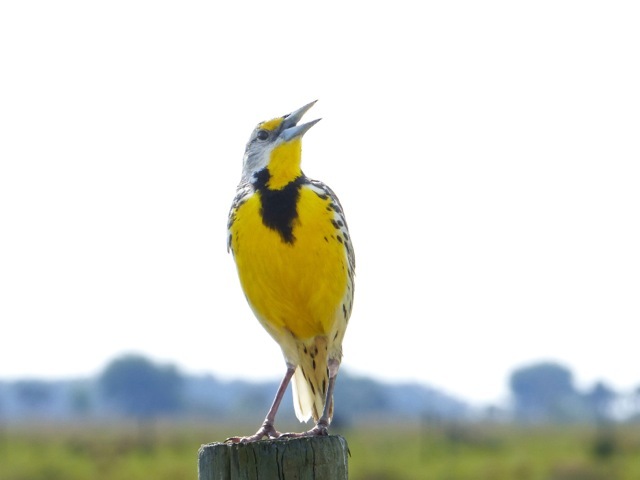 Eastern meadowlarks and red-winged blackbirds provide background music. For magnificent places like this, we have those to thank who set aside lands to conserve plants and wildlife. And give us endless hours of delight. Here in Sarasota County, we have benefited from the generosity of the Jelks family. The Florida scrub jay would be extinct were it not for Oscar Scherer State Park, Lyonnia Preserve and other protected places where they can thrive in their original habitats lovingly maintained by land managers. Selby Gardens has an active plant preservation program. 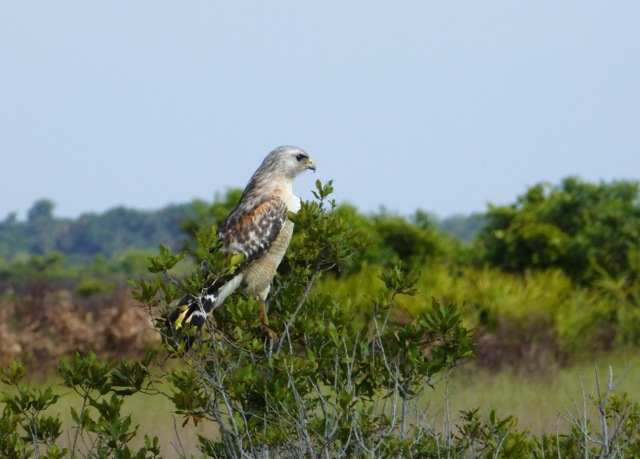 In the center of the state, Bok Tower and Archbold Research Station cultivate and plant out rare scrub plants. The Green Swamp and closer to home, Carlton Reserve, ensure our water supply. In the 1770’s, William Bartram delighted in the endless array of plants and animals he encountered on his four-year trek through the Southeast. Everything in nature was of equal importance to him. In our world, nature is a top-down construct. We bulldoze vast swaths of land for development, destroying thousands of plants and animals in the process. We relegate animals to the edges of our turf--parking lots, malls, and landfills. We humans are overrunning the place-- seven billion of us and increasing daily. The eight billion other species are being squeezed out or off the planet. Extinctions are at ten times the normal rate. The good news is that at the grassroots level we are seeing a growing awareness of the plight of the planet and taking action. Organizations and individuals are coming together to protest against profligate appropriation of protected wetlands, to preserve parks in their original states, to educate people of all ages on water conservation and planting native, They work to put a stop to Big Oil and the mining and fracking so destructive to the Earth. As always, we try to bring along those in charge who have turned a deaf ear to what is increasingly a dire situation. We humans have been well cared for. We’ve been sheltered, fed and healed by Creation. I sit on what once was a maple tree and eat at an oak table. My refrigerator is filled with “fruits” of the land. As people always have, I use medicinal plants for healing—arnica montana for pain relief, tea tree oil as an antiseptic, calendula for scrapes and bites. Now WE are called upon to be caregivers. 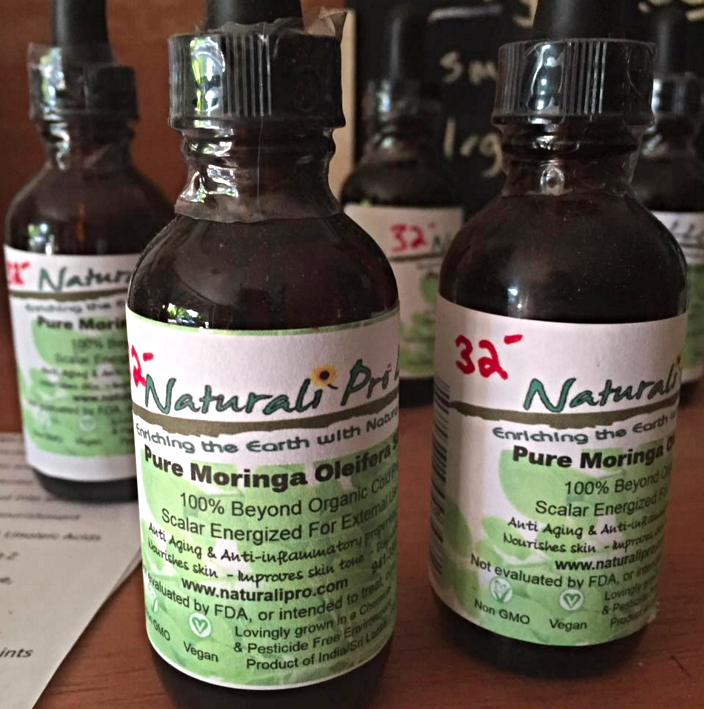 We carry Moringa Oil from our friends at Naturali Pro of Florida. "Moringa seed oil is high in antioxidants and contains palmitoleic, oleic and linoleic acids along with vitamins A to Z. It has anti-aging properties, soothes and prevents wrinkles, used to soothe pain caused by arthritius and gout, diminished blemishes and cleanses. Contains antiseptic and anti-inflammatory properties to help heal minor skin complaints." 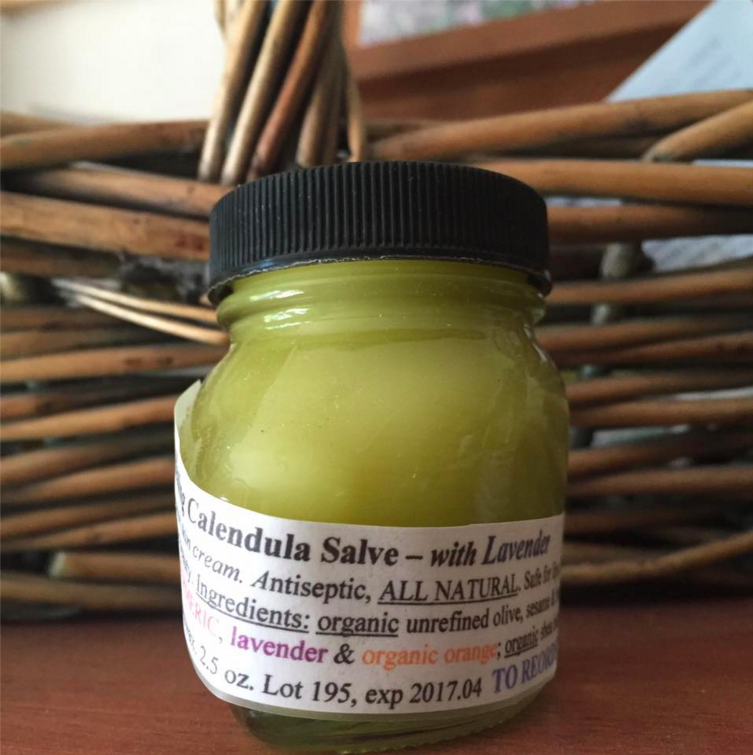 Louise’s Healing Calendula Salve is restocked! 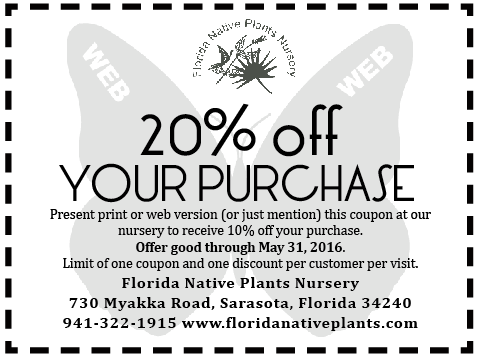 Copyright © 2016 Florida Native Plants Nursery & Landscaping, All rights reserved.